At the end of last year, members of the JSS/US, NBTHK/AB, and NBTHK/EB were able to buy the first volume of our joint 5 volume Tosogu Classroom project at the actual cost of producing the books. The translation was paid by the three above mentioned parties as a benefit to their members. The first volume is now also available for non-members for the price of $60.00 (+ shipping, ~$4 US, ~$6 EU). For the time being, the book can only be ordered from me directly and public sales on Lulu and Amazon will not be released until the end of the year. 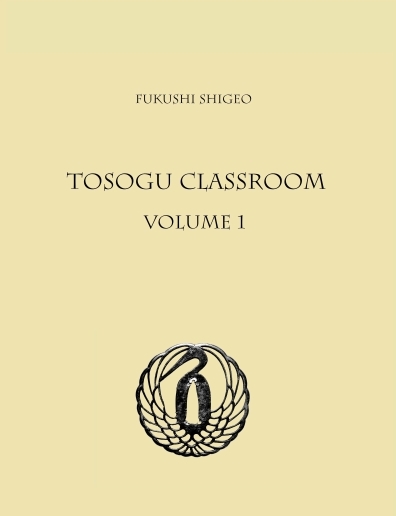 The first four volumes of the Tosogu Classroom set are hardbound with a dust jacket (US only), 8.5″x11″, will cost $60.00 each, and contain more than 500 pages of text with hundreds of black and white pictures. The fifth (complementary) volume is hardbound too, has the same format, will be approximately 350 pages but with illustrations being in color, it will cost $120.00. Volume 1 includes an introduction into fittings, materials, design, surface treatment, carving, inlay, coloring, early tsuba (both iron and kinkô), and the beginning discussion of artists and schools who worked in iron, going into great detail on the artists and work they produced (please find the table of contents of volume 1 below). Volume 2 will be the second volume on iron and volumes 3 and 4 will cover the kinkô artists. Considering the number of pages and pictures each volume will contain, either individual volumes or the complete set of five will be a valuable addition to your library. Please get in touch with me via “markus.sesko@gmail.com” if you want to order the first volume, or if you have any question. Excellent! I’d like to purchase the first volume. When are the other volumes due? Also, I’d like you to have a look at a signature for me. I saw your mail that you now charge $150, which is fine by me. I can send you pictures of the piece. Email sent. Thank you Peter! Will this be available as a pdf file as well? Yes, but only after all volumes have been released.